It’s near the end of the 18th century, and you’re a French aristocrat. The commoners are getting restless, but you’ve still got cool aristocratic stuff to get done, like trying not to get beheaded and preparing for the big ball. Anybody who’s anybody is going to be there, and you’ve been looking forward to it for the past few weeks. But oh no, you don’t know how to dance! What do you do? The Ballroom Dance club, headed by Amberleigh Ray ’18, meets every Tuesday at 7 p.m. in the aerobics studio in the Scot Center. The 7 p.m. meeting is open to dancers of all skill level, so it doesn’t matter if you have two left feet. Following the first meeting, the club holds another meeting at 8 p.m. for more advanced dancers with more experience. “But wait,” I can hear you saying, “I don’t want to just waltz for an hour. All the cool kids at Versailles are doing neat, new-fangled dances.” Well, don’t get your petticoat in a bunch; the Ballroom Dance club at Wooster devotes the first half hour to learning standard dances and the second half hour to learning Latin dances. You’ll learn the classics, like the Foxtrot, Tango and Viennese Waltz, but you’ll also learn ChaCha, Jive and Samba. Dr. Niklas Manz, professor of physics at The College of Wooster and his wife, Yvonne, teach the class. Both of them have experience in competitive dance, so don’t worry — their moves are legit. They usually begin lessons by demonstrating new steps, and throughout the 7 p.m. meeting, they and Ray help students if they’re having any trouble with the new dances. Now, you might be anxious that practicing once a week isn’t enough to prepare you for the ball. After all, practice makes perfect. Well, Ballroom Dance Club is expanding their schedule to include a meeting on Thursdays from 8:30 to 9:30 p.m. According to Ray, these meetings will feature more modern music, so you’ll be able to learn how to cut a rug in all sorts of ways. That’s right. 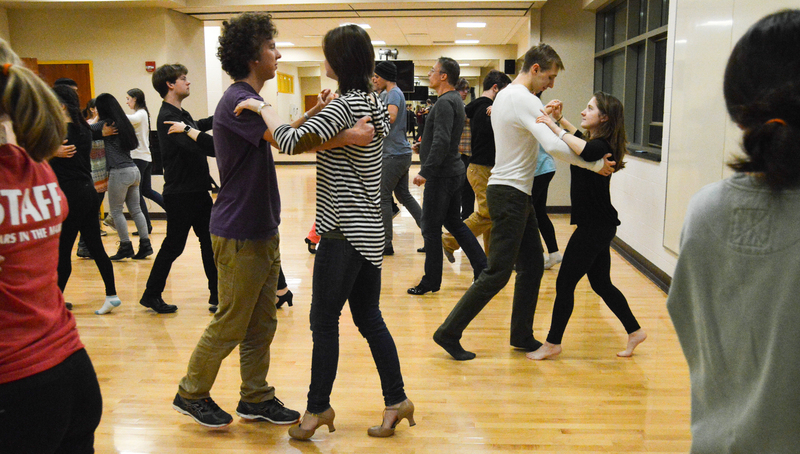 Unlike in feudal France, everyone is on equal footing in Wooster’s Ballroom Dance club. Ray even takes requests from students. So if there’s a specific dance you’d like to learn or a song you’d like to dance to, head on over to Wooster’s Ballroom Dance Club and check it out.